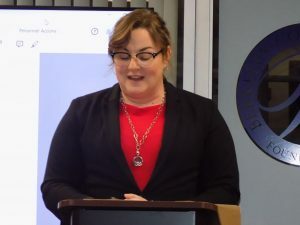 Jessica Salfia, who teaches English at Spring Mills High School, was among those who spoke out during the Berkeley County Schools board of education meeting against the education bill under consideration in the state Legislature. MARTINSBURG, W.Va. — Teachers, staff members and board members sounded piercing alarms at the Berkeley County Schools’ board of education meeting Monday night regarding the education bill moving through the state Legislature. “To be frank, this bill is dangerous,” said Jessica Salfia, who teaches English at Spring Mills High School, during the Citizens’ Forum portion of the meeting. She was among three teachers and a staff member who spoke.